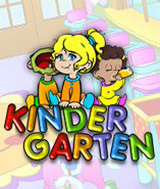 Kindergarten is a colorful and fun-filled time management game in which you help Mila, the super sweet owner of a day care center, look after the babies whose mothers drop them off. You'll have to take good care of the children so they stay happy. Not only is this important for them, it'll also earn you more money! Once you've earned enough cash, you can start purchasing all kinds of wonderful upgrades for your day care. You'll also be able to hire people to assist you and increase your day care center in size. Are you ready for this baby-driven challenge? Comments: This is a cute game in which you manage a day care center full of babies. Young girls who want to play Mommy will like this game very much. As you earn money you can buy more equipment and upgrade it.